One Momma Saving Money: Score Coffee K-cups and hot cocoa for as low as $.21 a cup! 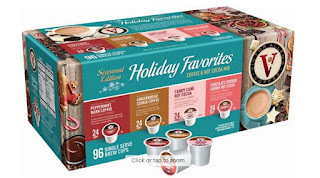 Score Coffee K-cups and hot cocoa for as low as $.21 a cup! Head over to Best Buy where you can score a Victor Allen's - Seasonal Edition Holiday Favorites Coffee Pods (96-Pack) for only $19.99 (normally $49.99). That makes it $.21 a cup!